The Tour de France is an annual bicycle race that covers around 3,500 kilometres (2,200 mi) throughout France and bordering countries. The race lasts 23 days and attracts cyclists from around the world. The race is broken into day-long segments, called stages. Individual times to finish each stage are totalled to determine the overall winner at the end of the race. The rider with the lowest aggregate time at the end of each day wears a yellow jersey. The course changes every year but it has always finished in Paris and in more recent years along the Champs-Élysées. 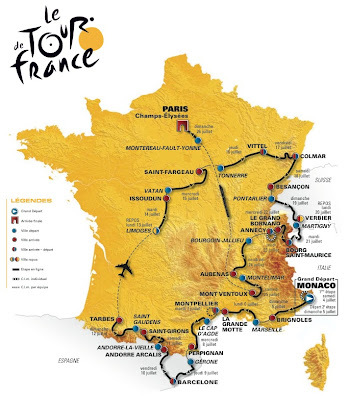 The Tour de France is the most well known and prestigious of cycling's three "Grand Tours". The other two Grand Tours are the Giro d'Italia (Italy) held every May and the Vuelta a España (Spain) held every August-September. The Tour de France is a bicycle race known around the world. It typically has 21 days, or stages, of racing and covers not more than 3,500 kilometres (2,200 mi). The shortest Tour was in 1904 at 2,420 kilometres (1,500 mi), the longest in 1926 at 5,745 kilometres (3,570 mi). The three weeks usually include two rest days, sometimes used to transport riders from a finish in one town to the start in another. The race alternates between clockwise and anticlockwise circuits of France. The New York Times said the "Tour de France is arguably the most physiologically demanding of athletic events." The effort was compared to "running a marathon several days a week for nearly three weeks", while the total elevation of the climbs was compared to "climbing three Everests. The number of teams usually varies between 20 to 22, with nine riders in each. Entry is by invitation to teams chosen by the race organiser, the Amaury Sport Organisation. Team members help each other and are followed by managers and mechanics in cars.Riders are judged by the time each has taken throughout the race, a ranking known as the general classification. There may be time deductions for finishing well in a daily stage or being first to pass an intermediate point. It is possible to win without winning a stage, as Greg LeMond did in 1990. There are subsidiary competitions (see below), some with distinctive jerseys for the best rider.Riders normally start together each day, with the first over the line winning, but some days are ridden against the clock by individuals or teams. The overall winner is usually a master of the mountains and of these time trials. Most stages are in mainland France, although since the 1960s it has become common to visit nearby countries. Stages can be flat, undulating or mountainous. Since 1975 the finish has been on the Champs-Élysées in Paris; before then, the race finished at theParc des Princes stadium in western Paris and at the Piste Municipale south of the capital. The roots of the Tour de France can be traced to the Dreyfus Affair, a cause célèbre which divided France at the end of the 19th century over the innocence of Alfred Dreyfus, a soldier convicted – though later exonerated – of selling military secrets to the Germans. Opinions became heated and there were demonstrations by both sides. One was what the historian Eugen Weber called "an absurd political shindig" at the Auteuil horse-race course in Paris in 1899. Among those involved was Albert de Dion, the owner of the De Dion-Bouton car works, who believed Dreyfus was guilty. De Dion served 15 days in jail and was fined 100 francs for his role at Auteuil.The incident at Auteuil, said Weber, was "tailor-made for the sporting press." The first and the largest daily sports newspaper in France was Le Vélo, which sold 80,000 copies a day. Its editor, Pierre Giffard, thought Dreyfus innocent. He reported the arrest in a way that displeased de Dion, who was so angry that he joined other anti-Dreyfusards such as Edouard Michelin and opened a rival daily sports paper, L'Auto. The new newspaper appointed Henri Desgrange as editor. He was a prominent cyclist and owner with Victor Goddet of the velodrome at the Parc des Princes. De Dion knew him through his cycling reputation, through the books and cycling articles that he had written, and through press articles he had written for the Clément tyre company.